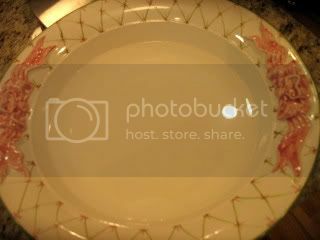 Alma, aka known as The Tablescaper, met me in our little town for a quick lunch..and 4 hours later we parted, I am sure we will do a repeat performance..
After lunch, we stopped at Villeroy and Boch's basement to look for bargains. Alma bought some lovely things, and I added to the Christmas plates I bought last year. After all, it is less than 5 months away..
We never ran out of things to talk about, it was so much fun! 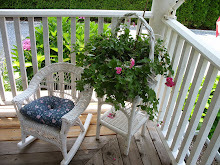 Do check out her blog..the view from her deck is to die for! I was looking at my pink hydrangea and noticed the little specks of blue in the center.. 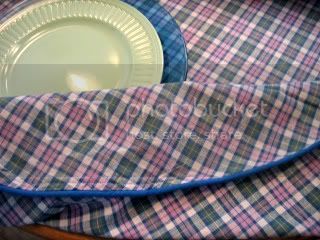 I have had this blue/pink/green plaid tablecloth for years, and never used it.. 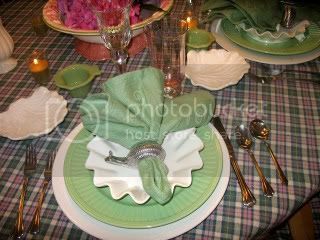 I used white chargers from Noritake outlet, green plates and a white ruffled bowl from HG. The napkins are Villeroy and Boch, by way of HG, and I think I paid 1.00 ea or less in the clearance. 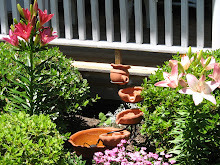 This pretty pink and green bowl was used to float my pink hydrangeas. Can you see the pink ceramic bow detail? 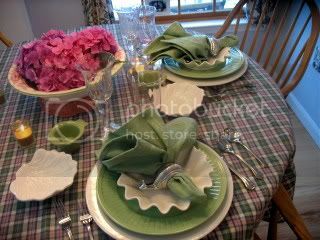 Some green votives, pink glass by Lenox , napkin ring from WSonoma outlet, and clear stemmed glass from Pfaltzgraff outlet. 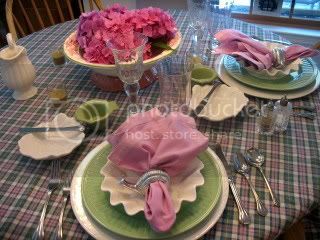 I tried out those new rose color cabbage leaf soup bowls I showed you, but the pinks weren't just right..
Miss Janice never showed, but if she ever comes to visit, I will deck out a table just in pink and green! So what will we eat?? 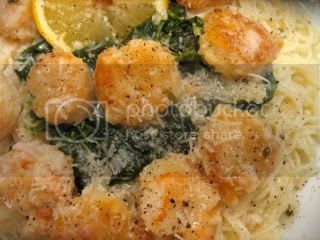 Shrimp are pink, and served on a bed of spinach over angel's hair, I think the colors will all work..
And a little blueberry crumble with vanilla ice cream for dessert.. 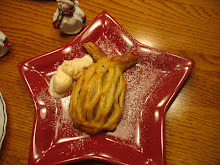 The food looks delicious and those snail napkin rings are great! What a pretty table. Even though I am not crazy about pink, I do like pink/green combo. I really like that tablecloth and love, love, love the gorgeous hydrangeas. How fun to get to go to lunch together! I am sure y'all had a ball!!! I have really enjoyed meeting bloggers face to face! your table is lovely. Love those napkin rings. and everything looks so nice on the tablecloth. 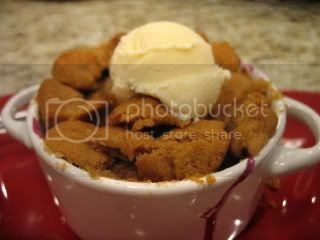 My mouth is watering as I look at the shrimp and the crumble!! Glad you had fun..I have never been not happy meeting a web friend.Always..exactly as nice as I imagined. Love the pink relief plates!!! Love all the combinations you came up with! I'm partial to pink so I think the pink napkins I liked best! 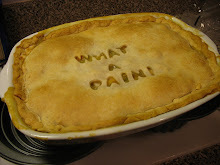 Food looks out of this world! love it that you got out the tablecloth. love the napkin rings. How neat to meet another blogger, Kathleen. I did too a few months ago and we are trying to plan another get together. We are hundreds of miles apart, BTW!! The entree looks delish!! 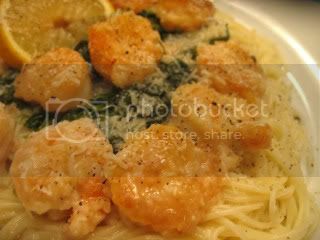 Your little shells that you were going to use for bread would be perfect to put the tails in (if you left the tails on the shrimp! ), but if not, you have that "seafood" theme there! A four hour meeting must mean it was time well spent with someone you had some things in common - well, table settings, of course :) I know it was much more than that. 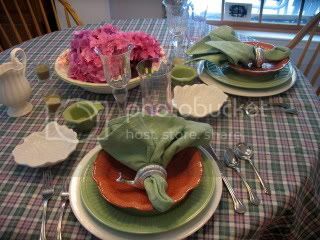 I love the green plates and pink napkins - a great combination, IMO. Beautiful bowl and your hydrangeas are always spectacular, Kathleen! Glad you got to meet! I am still waiting, LOL! Four hours sounds like a great meeting to me! Great looking table, Kathleen, the pinks are so pretty! Pretty in pink for sure! Very pretty! I always love the pink and green combination and your's is lovely. Beautiful table! Love pink and green together -- and wow, that's one gorgeous hydrangea bowl arrangement. Lovely. And I feel left out --didn't get a dating service pop up. I'm sulking. . . . Very pretty! 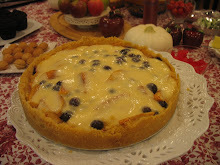 And the food looks so delicious! Kathleen--I might pop in with Miss Janice. I love pink and green together also( we did "the wedding" in those colors!) That bowl with the raised bows is fabulous! Four of us bloggers are having lunch and shopping for the first time tomorrow--isn't it fun?!! Love the table and menu! Kathleen, Sounds like you have a fabulous time meeting with Alam at The Tablescaper. Love the combinations you used on your table! Pink and green just sing summer to me. Your meal looks so delicious! Thank for sharing (I'm hungry now! haha)! 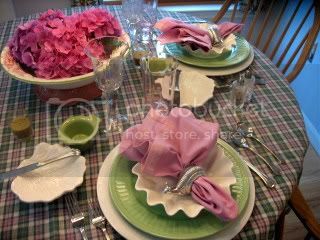 A very pretty table -- pink and green are such a beautiful combination and you did it very well. So much fun to make a new friend! Hope the two of you are able to get together again. I just love your pink and green table. You might have noticed I love the combination. Your shrimp have me hungry! Good morning, Mizz K., I missed all this yesterday..helped decorate a church for a wedding from 8 til 5 and was too tired to even turn on my computer! Your table is so so pretty. I love it all. And...your menu!! Yum-MEE!! 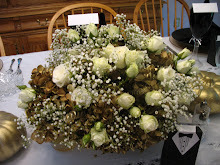 I am hosting a Bridesmaid Luncheon today but will get back in the afternoon and will stop back by.. 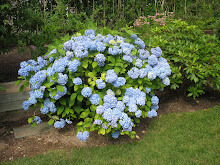 I do believe your are the Hydrangea Queen! My Pink Sat. 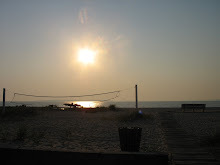 post is about meeting a blogging friend this week. I spent 15 minutes trying to get that dang dating service thingy to come up but.....it never did! SHOOT!! ;)and here I was....wantin' a date !! How sweet that you got to meet a fellow blogger! I recently got to also. Your table is lovely! 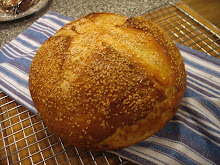 I just had a minute to sit down and catch up on blog peaking this week. Been held captive by a 2.5 yr old who requires my undivided attention. 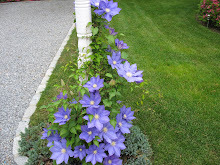 I love your tablescape and your kitchen redo and your LI map and visit with a friend as well as meeting a new blogger. You have had a busy week. Laughed at how when you go to casinos you loose your shirt:) I think the bowls at HG at that price is a score. I was at HG last night for a few minutes while hubby was getting his new computer (spilled coffee on it and we had to bury it becasue it certainly did fry) but could not find a single score on the sale end cap. Found tons of other goodies I really do not need just want. HG is my favorite fantasy store besides a bakery. I only wish I was getting the dating service instead of my photos disappearing into thin air??? Trying to put some photos back on the blog but I honestly don't remember which ones:) Life is too short to worry about blog photos and I say on the with the show of life! I too had a wonderful time!!! I must admit, I was a bit amazed when I realizd it was 4 hours. It sure didn't seem that long!!! You know what they say, time flies when you're having fun. And I honestly felt like we barely scratched the surface. I can't wait to get together again. Love this week's table. 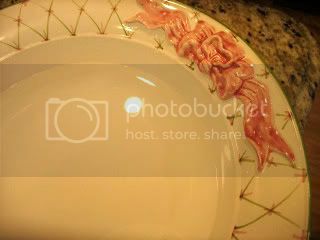 The edging on the small white bowls under the pink napkin remind me of some of the serving pieces from the Christmas set you purchased the plates for. Where did you get those???? Again, I had a fantastic time! Kathleen, not surprisingly, you set another lovely table with fantastic looking food. What I really enjoy is your "stream of thought" about your decision-making process and choices available. I just can't help myself...I love the pink napkins best! 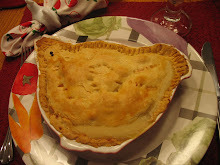 Your tablescape is just beautiful and the food looks delish! Hope that get to meet S. Lee...I love her! I love it! I too like the pink napkins the best but then I'm a pink kind of gal ;) How do you have so many tablecloths that you haven't used this one yet? You are my tablesetting hero as I don't think I've seen everything you have twice yet. I love the pink and green combo Kathleen. The raised bows on the bowls are so pretty. I do like both the pink and the green napkins...so I would probably choose both! This is great. Love to look at all the beautiful tablescapes. I need to be reminded of what I should be doing. 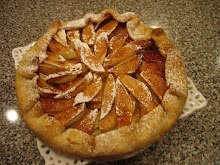 I love to cook but am very weak in presentation. Keep reminding me. Beautiful table! 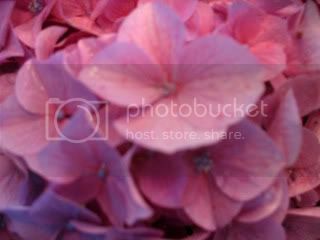 I love your pink hydrangeas...and the bowl you float them in is beyond gorgeous! I love that you met a fellow blogger...isn't that what it's all about...making new friends and sharing wonderful ideas! Can't wait to see what you guys bought!